Yesterday afternoon the American Association of Museums announced the winners of its 22nd annual awards at the conference in LA. Ron Davis (pictured below with Tsivia Cohen of CCM) was there as Skyline, at the Chicago Children's Museum, was honored with the Excellence in Exhibitions award: Special Achievement in Cooperative Learning. We are, to be honest, proud of this recognition. 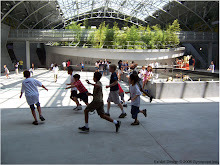 Gyroscope began working with the Chicago Children's Museum in 2003. At the time, we were doing a combined architecture and visitor experience master plan. As part of that we, together with the museum and the Erikson Institute, researched and wrote the Standards of Excellence: A Model for the Chicago Children's Museum. That project was a chance to step back and survey the early learning/early childhood community at large for ideas, trends, issues, and leadership opportunities that might be appropriate for CCM. That study was the basis a few years later of the NSF grant, Partnership for Playful Learners which funded Skyline. The PPL grant proposed to study 2 things: (1) how to use design strategies to increase parent participation in the exhibit and (2) how to create a public exhibit that can also serve as a research lab contributing new understanding to the field of informal science learning. "Adults' enthusiasm for the exhibition's design might help to explain why more adults were willing to accept the challenge of working with and teaching their children and why they described this collaboration as extremely satisfying." The idea that design can influence behavior is not new - urban planners, public artists, industrial designers, environmental psychologists and others hold this idea as a central tenet of what they do. But in museums, it is surprisingly under appreciated. Design is seen as a delivery mechanism. We at Gyroscope believe that the environmental nature of museum experiences is incredibly powerful and that design can be harnessed to increase interaction, support collaboration, help visitors take risks, and increase dwell times. And through its influence on visitor behavior we believe design has a lot to do with visitors' learning. In Skyline, the goal was specifically to support the learning behaviors we wrote about in the Standards, and to engage adults in specific behaviors as well that would support their children's learning. The second goal - of creating an exhibit that can contribute new knowledge to the field - is similarly ambitious. There are other exhibits that look at how people learn, and labs set up in exhibitions. But Skyline is meant to be used as the research environment in informal science learning. The idea of learning about learning applies to the museum, not just to visitors. and supported these goals, while creating an artful and robust exhibit experience." Next time you are in Chicago we urge you to visit. When the Renton History Museum launched our master plan process, we knew we had an intimidating set of challenges to address. Some were specific to our city and organization, and others were the same 21st-century challenges that museums across the country (around the world!) are tackling. We had some great assets as well: a fully engaged board and staff, operational support from our city, and creative consultants used to thinking outside the box. And “outside-the-box” definitely describes the strategic approach that we developed together! At the end of our six-month master planning process, the new strategic approach we settled on is one we’re calling the Experimental History Project. The approach calls for the Renton History Museum to break down barriers between “doing history”—traditionally the job of staff—and “viewing history”—formerly the role of museum visitors. The plan calls upon the museum to work directly with our community to link the past to the present and the future in ways that are relevant to those we’re working with, whomever they may be: students, ethnic communities, artists, scientists, engineers, the list goes on. Exhibits and projects will be designed to attract project-specific resources, whether ideas, funding, or humanpower. The new program is designed to allow staff to take calculated risks and learn from them to improve how we fulfill our mission. To some extent it incorporates the learning process into actual museum operations: we explore a new idea, measure it against a matrix of our strategic goals, enlist partners, try the idea together, and then incorporate the lessons learned and partnerships established into the next project. The Experimental History Project recreates the museum as a Big Tent; staff trade control for greater involvement and engagement by the historically minded. How does the new strategic approach address our challenges? Start with the need to grow a new generation of supporters—whether volunteers, members, or donors. The Experimental History Project assumes that every project we undertake will involve partners. Whether they are helping us develop a new exhibit or lending us objects or photographs or offering programs, these partners will continually renew our connection to the community, and keep their concerns at the core of our operations. Because our projects will be interdisciplinary—history and art, for example, or history and science—we will speak to stakeholders who are not necessarily already narrowly interested in history. And because of our willingness to take risks together with our community, we all become joint stakeholders in the success of the museum. If this all seems a little theoretical, that’s because it is a plan, the details of which have not yet been worked out. Some unknowns are already emerging. We’re finding some funders squeamish about the notion of supporting an “experiment” in a tough funding climate and in a discipline—history—that’s notoriously slow to embrace innovation. Potential partners are clamoring to be involved; we are figuring out how to be strategic about how many projects we can work on simultaneously. Finally, we are experiencing the inevitable resource lag, particularly in a flat economy, in which the museum has a surplus of excitement and ideas, without a comparable surplus of funding (yet). We believe these are challenges that we will work through in the implementation of the Experimental History Project. We’re excited to embark on a new vision that, if successful, could be a model for other museums. The Oregon Museum of Science and Industry is working on a NSF grant funded project on sustainability that includes a 1500 sf exhibit, offsite exhibits and an expanded design checklist that will give the museum field a way to measure the sustainability of an exhibit. I am serving as a professional advisor for the design checklist on this ambitious project so I was at their Sustainability Symposium in Portland on May 17th and 18th. The approach to project is being framed by the 3 pillars of sustainability : environmental, economic and social sustainability. While these are familiar terms, and come from the broadly accepted definition of sustainability, it was an interesting challenge to examine them within the context of the museum and of creating a guide for exhibit design and fabrication. Typically, when we think of sustainable design we focus on the environment. Materials and energy usage are measurable issues that we can all understand within the context of an exhibit, but by including the economic and social dimensions OMSI is encouraging some new thinking. 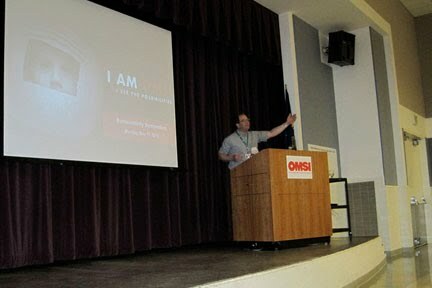 Ben Fleskes, the Production Director at OMSI suggested that the design and fabrication of exhibits could be a tool for creating social value by inviting volunteers into the process. OMSI is also trying to incorporate the social dimension by using outreach programs and engaging the community in the development process. Ben is also interested in finding a way to mark the tangible value of the contributions of the PEOPLE who are a part of the project. So the social piece is about being local, building knowledge and valuing volunteerism. On the economic side we talked about the need to doing more with less - with the overall goal of creating "a sustainability of abundance and prosperity". Finding ways to do more with less could include leveraging prior work done in the field (to avoid reinventing the wheel for every exhibit). The Exploratorium Cookbook is one such resource for this way of thinking about conservation of resources. The economic issue also needs to color how we think about green materials. There are ample choices for specifying $400/sheet "green" materials. But is that material sustainable when you consider the economics? Maybe green and sustainability are starting to mean different things in this framework. Using the "three pillars" framework for museum exhibit design leads to some other opportunities (in addition to the ones OMSI has identified). I'm thinking specifically about DESIGN. The way design creates a context for social interactions in the museum suggests that it can be a key tool for social sustainability. The design of the exhibits can support social interaction, collective work, and parent child interaction all of which can in turn support the central tenets of sustainability OMSI has articulated. This synergy between design, content, and the social context is really a rich point especially for a project with sustainability as the content not just the strategy. OMSI's commitment and enthusiasm for this project along with their impressive capacity gives them a real opportunity to develop something that will have impact within the field. I look forward to the evolution of the sustainable design checklist to see how these less measurable dimensions of sustainable design can be represented in it. We all presented projects we are working on at this meeting, so I have heard of some interesting approaches. But we are interested in your experience. Do you think about green and sustainability as meaning the same things? Do you agree with me that the exhibit can go beyond modeling the "social pillar" of sustainability and actually encourage visitors to engage in the kinds of behaviors that OMSI wants to support through its exhibit development practice? Planning in a Perfect Storm? Inside and the outside the museum world, people are arguing that this period appears to be the proverbial “Perfect Storm.” Leave aside “the Great Recession” and you still have: the graying of the very Baby Boomers that supported the expansion of museums in the past 20 years; rapidly changing technology that has spawned the “Born Digital” generation, with radically different leisure expectations; and the emergence of a majority minority population in the U.S. These changes have been sneaking up on museums for years, but the sudden necessity to do more with less makes them seem even more daunting. For a small history museum like ours—with the equivalent of three staff members and a budget less than $350,000—planning is essential. As our environment changed, we watched our volunteer and member base decline, even as our visitor numbers were flat and demand for services outside our building—curricular materials, classroom programs, and talks—expanded. Certainly our collection didn’t represent the diversity of a city in which students speak 57 different languages. We began to suspect our exhibits and programs were also out-of-step. * Readiness for change is a precondition for planning, because the process can be so easily defeated by an insistence that “we’ve always done it this way, because it’s the only way that works.” Change is painful, but the planning process itself can help prepare your stakeholders for the fact that change can represent renewal (and maybe salvation) for your institution. * Take advantage of technology. You’re reading this on a blog, so you’re already convinced of the community-building potential of social networking. But you may have to persuade your stakeholders to join in a virtual space to keep the conversation going and fuel interest and energy during the planning process. Be prepared to patiently hold the hands of technophobes. If you choose a site that’s simple and versatile—like wiggio or ning—and the conversation is compelling, the benefits are worth it. * Look outside your four walls for community-wide challenges (and solutions). Our planning process revealed that organizations all across our city are struggling with generational change. The generation that had established many of the institutions and events around town was having difficulty letting go of the reins; at the same time, they themselves expressed fatigue with the work of civic leadership. One of the solutions that emerged during our master plan was a new circle of giving, The Next Curve, founded by “the young and the young-at-heart” interested in learning about civic leadership. Does any of this sound familiar? I’d love to hear from you about how your museum is addressing your 21st century challenges. In my next guest blog post, I’ll share the new strategic approach that Gyroscope Inc. helped us develop. Museums are incredibly complex environments to operate in. In part, this is because museums have to support many different modes of use. They have to accommodate drop-in visitors and school groups of course. But if you were to do a flow map of a museum you would also need to include a route for catering, another for exhibit load-in for permanent exhibits and one for temporary exhibits, another for supplies and materials used in the exhibits that get refreshed periodically, the routes for program staff and supplies, camp groups, staff circulation routes of course, and then there are visitors to the administrative areas of the museum. And you have to map those uses onto the building for both business hours and after-hours functions. Many people would say that the most efficient solution to circulation is to incorporate it directly into the public spaces of a museum. That sounds great - maximize the galleries, and get more exhibition area for the same cost. But not having corridors also means that moving anything into the museum, from a large object, to a bin of recycled materials for an art activity, to an air compressor and nail gun, means moving through visitor spaces. This puts museums in the position of having to choose whether to disrupt visitors, or only move things through the building after-hours. It is a difficult trade-off. And it impacts not just logistics, but the operating budget because it could require staff to monitor movers, caterers, and others who are now interacting with the public, or who suddenly have access to areas of the museum unrelated to their work. I cannot remember the last time I saw doors on an exhibit gallery. The lack of doors communicates accessibility and welcomes visitors to explore at will. And it is not only friendly, it is sensible. Visitors can see into areas as they approach and that helps them make decisions about where to go. Good sightlines also serve as an advance organizer, allowing visitors to create a mental map that helps orient them in the space, giving young visitors greater independence, and contributing to a feeling of ownership and belonging. But no doors means that it is not possible to close off parts of the museum. For an event rental like a birthday party this means that areas of the museum cannot be sold as exclusive packages just for a small group. And after-hours, security is required to keep people from accessing off-limits parts of the facility. If that is not acceptable, then the whole museum has to be lit and staffed for even a small event. These are just two examples of the kinds of issues that come up in a museum architecture project. Neither of these would be such a big deal in a retail operation. But museums are not retail - it is not possible to open the doors and put out the stacks of folded shirts and just GO. Museums are constantly changing, tweaking, and adjusting to keep thing fresh and new. Event rentals are a significant portion of museums' earned income. It turns out that museum architecture has to be related at a deep level to assumptions from the business model, staffing assumptions, and the culture of the organization. The ACM 2010 meeting did not differ greatly from other ACM meetings in format, discussion, or informal conversations. I found it interesting that the economy was no longer a main focus of conversation (it remains a concern but seems less urgent). Risk-taking and green design/implementation/practice were more topical this year. · Risk-taking was a big topic of conversation. Institutions are trying to step out of the box and create innovative projects despite concerns for safety and legal pressures. · Green design and practice was also a big focus with many sessions on this topic. 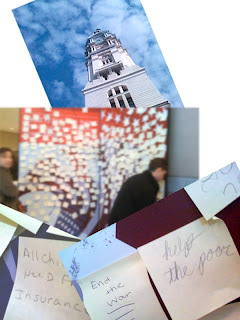 · There was less conversation about the economy, but fundraising remains difficult and there were many conversations about creative fundraising. · Some of the presentations included: Children’s Museum of Phoenix talked about risks taken with their new climbing structure. Looks very cool and City Museum-like and opens on May 21st. · Very interesting session about the ILMS 21st Century Skills framework and how two museums have implemented it. · The Children’s Museum of Houston has framed its entire strategic plan around the framework. · The session focused on how Museums can take part in preparing children for the skills they will need in the future including: “just in time” learning, making sense of on-line information, digital literacy and creative problem-solving. · Changes in museums have been fuelled by this need for change: from presentation/display to audience engagement, from located in community to embedded in community, and focused on outcomes and evidence. · The Children’s Museum of Houston has been focusing on allowing visitors to use their smart phones to connect to the Museum and its content and combining the virtual and on-site Museum (they will host next year’s ACM and it would be interesting to see how they are doing this). · The panelists were largely against technology for technology’s sake and quoted a 3/6/9/12 rule. No screens before age 3, no internet before age 6, no electronic gaming until age 9 and no unsupervised internet before age 12. A study in the UK showed that parents want less technology at Museum for their kids. · NEH has published a paper about technology and the humanities. · Madison Children’s Museum talked about their rooftop garden and greenhouse. All materials for their new site are natural, including straw, clay, stone and wood and local (within a 100 mile radius). · The rooftop will include a chicken coop and pigeons. School kids will be able to take a pigeon back to school that will fly back to the Museum. · Madison Children’s Museum founded the greenexhibits.org website of resources. · The Children’s Discovery Museum of San Jose’s (CDMSJ) outdoor exhibit was originally about the past, called “The Way Back Lot” but is now called “The Open Lot,” focusing on nature play. This was influenced by Wild Zones, which is a new organization. · This session looked at using recycled and retooled materials for exhibitions and building projects. · The Madison Children’s Museum presented their building project, which uses all recycled materials including old school gym floors and bleachers. · Mill City Museum is built in an old flourmill. The building burned down in the early 1990s and they have rebuilt the façade but used the destroyed building as its own interpretive element. The museum includes an exhibition area downstairs and a wonderful object theater viewed on each floor of the museum while sitting in their freight elevator. An observation deck in the upper floors presents change over time in the industry and the city. Included in the exhibit area downstairs is a staffed baker’s workshop, which is open during museum hours. Staff time on visitor participation? We wanted to check in and ask the general museum community how it's going with your visitor contribution exhibits. Things like post-it walls, maps, and other non-digital participatory experiences that require upkeep. Has it had any impact on staff time? Maintenance? We'd love to hear from you. Image: National Constitution Center by Gyroscope. We asked museums whether they conduct research in their museum. The answer seems to be that about half of children’s museums do some kind of research. Of the museums that took our survey, 20 said they do, while 22 responded that they do not. Of those that do some kind of research, 17 partner with universities, 10 with research consultants, 7 with professional associations, 4 with funders and with private nonprofit research organizations, and 3 with other. The research they are doing is primarily audience research, and is focused on whether exhibits are meeting their goals. They are using research to inform exhibition themes (14), influence how they approach exhibits (16), and to edit signage to make it more effective (10). Only a few museums explicitly tell their visitors about the research, their findings, and why it matters – 5 do so in their newsletter and 2 host lectures. What emerges from this answer is that most children’s museums are not conducting research into new scientific questions about child development, or informal learning, for example.Chicago Children's Museum, in the Skyline exhibit, is researching how exhibits can better support informal science learning, parent/child social learning, and the role of design as a scaffold for visitor behavior. And the Boston Children's Museum has the Playlab. A number of science museums do host university research departments in exactly this way – for example, the Museum of Science in Boston has a space set aside for graduate students. I have written about both Boston Children's Museum and the Museum of Science on this blog recently. I recently saw that the Minnesota Children’s Museum is launching a new initiative that may be moving in this direction as well. Children’s Museums strike me as a perfect place to push forward our collective understanding of self-choice, informal, and social learning. It will be interesting to see if this opportunity is embraced by more museums in the future. Why do the ways in which we measure success matter? Why do the ways in which we measure success matter? What we measure is an indication of what we think museum visits can accomplish. For instance, when we are testing for vocabulary we are looking to see whether visitors will recognize the specific concepts that the museum has identified as the most important. When we measure family interaction we are prioritizing social interaction and dwell time, and hoping to build inquiry skills and family bonds. So what we measure is indicative of the deeper, underlying learning models we are using, and assumptions we are making about what is even possible to achieve. The evaluation model an organization uses also speaks to its relationship with its audience. Does the museum see itself as a teacher, a resource, a mentor, coach, research assistant, partner, activist, other? The roles museums take on turn out to matter a great deal. There are many learning models used in the museum field and many thoughtful people have written about this including Ted Ansbacher and Chantal Barriault. So I will briefly describe the 4 learning models that are most relevant to the evaluation criteria listed by our survey participants. 1. Content Transfer. In an information-driven model exhibits often demonstrate ideas and provide information. For such exhibits, success can be determined by testing whether visitors learned vocabulary and key ideas. Testing here might also look at whether visitors understand the exhibit to have a big idea, and whether that understanding is consistent with the big idea the planning team had in mind. 2. Skill Building. This is more common in museums that encourage inquiry, use a child-development framework, and promote risk taking. Testing in this model focuses on things like physical and social competency, creativity and self-expression, good judgment, and a willingness to ask questions. 3. Lifelong Learning. More and more children’s museums are focused not just on building visitors’ skills, but in igniting a sustained interest in seeking knowledge, setting goals, and active participation in their communities. This concept of lifelong learning is based on problem solving, wonder, and curiosity, but extends it beyond the immediate visit. To determine whether a museum is succeeding at this you might evaluate visitors’ inquiry behaviors, the number of times they touch base with the museum either in person or online, and whether they get more involved in the organization over time. 4.Transforming Attitudes/Changing Behaviors. This is perhaps the most difficult and the most exciting. The Holocaust Museum, for example hopes to convert visitors’ interest into direct civic and political action. Many exhibits on wellness and on the environment have transformative goals – to change the health or environmental habits and outcomes of their visitors. These impacts are seen in day-to-day life activities such as meal planning, recycling, philanthropic activities, community activism, etc. making them the most complex to measure and track. Bringing this last goal back to children's museums, I know some that want to make adults better caretakers of the children in their lives. This isn't just about learning new words, or sparking interest in childhood. This is an ambitious agenda for social change. So what about changing behaviors? We did not hear of any museums that are pursuing longitudinal studies of their affect on visitors. We are seeing many museums interested in the appeal of their exhibits to diverse audiences. And we are seeing that most museums formal and informal behavioral evaluation do in the exhibit. We have heard a lot about setting goals for changing behavior and we would like to hear from museums about this in particular – has your museum hosted an exhibit designed to change the way visitors act in their day-to-day lives? What strategies have you used? And how is it working?